We took another night bus from Tehran to Isfahan for 280.000 Rials (7,30 €) per person. The bus arrived in town long before what we expected and it took us by surprise. As early as 5:30 am we were getting off the bus without any plan for the city. We headed to the west wing of the terminal and found a small room with people sleeping peacefully, we joined them without thinking much about what to do for a couple of hours. At 8:00 am we left the station, from the terminal, there are dozens of local buses to Isfahan city centre for only 20.000 rials per person, one of them is the number 91, it will leave you on the street where most of the hotels are. It is not necessary to pay a taxi since most destinations are covered but if you want to do so there are plenty of them just outside the station. If you do not go to the same destination do not be ashamed and ask the driver. As Always Iranians are extremely kind and will do their best to help you. 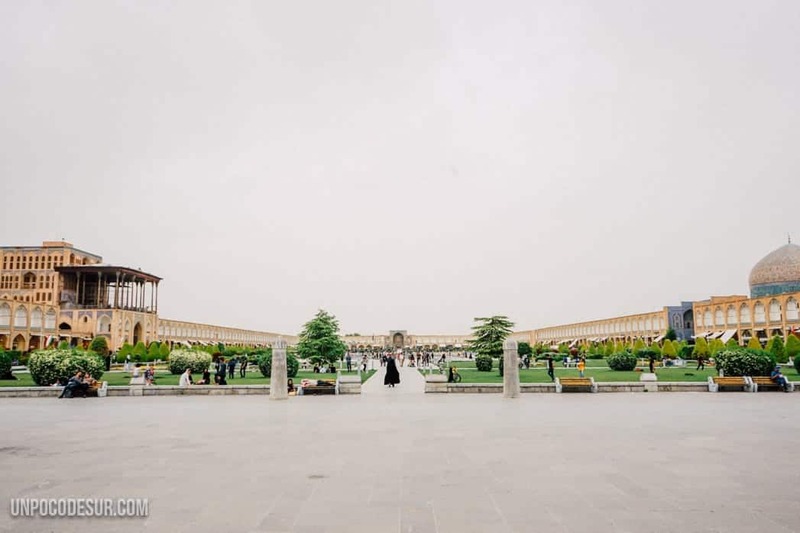 Isfahan is one of the most touristic cities in the country has nothing to do with Tehran. It became the capital of the Persian Empire on two occasions and in its architecture and its streets it is impossible to ignore the greatness of that past that today continues to leave a mark. Being one of the most touristic cities is also one of the most expensive. Finding a place to sleep at prices that in other cities would be possible here is slightly complicated. Be patient and do not despair, it took us a few attempts to get something in our budget. Once we had a roof it was time to discover the city, we were surprised by the contrast with the capital. For example, there are ways for bicycles, the pedestrian areas are much more friendly and in general, it is a city with a green touch that surprises. Here a list of the plans we liked most. Without doubt, the main attraction of the city, with a length of more than 500 meters is one of the largest squares in the world in addition to having been declared UNESCO heritage. 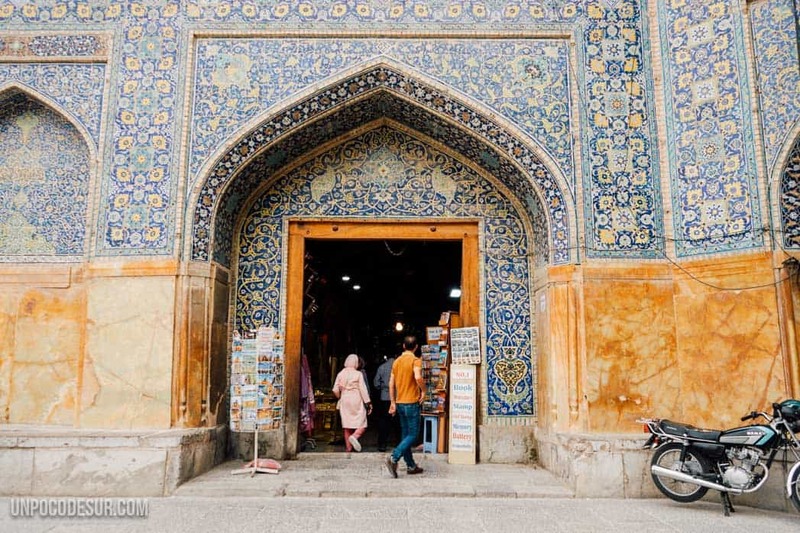 Throughout the square, you can enjoy the best sample of Iranian architecture with its characteristic blue, as well as one of the most beautiful mosques in the world. Yes, to enter every building you will have to pay, we are not really fond of paying for religious structures (of any religion) unless is like a massive thing. If you’re not going in don’t worry, a walk through the square or a little picnic are enough to enjoy the space. Its construction dates from the Safavid era and today works as a museum. Its name means “40 columns” and it’s obviously coming due to its 20 columns, the columns are reflected in the main entrance fountain (making a total of 40). Its surroundings are clean and well maintained green gardens (like almost everything in the city). 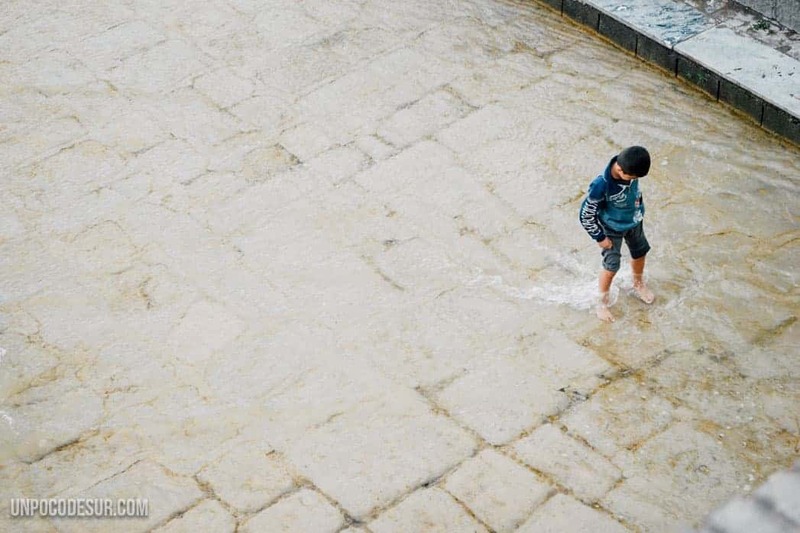 Being bathed by a river, Isfahan has a special air (well, we love cities with rivers) and certainly takes advantage of every meter of that particularity thanks to its monumental bridges. The most recognized is the Si-o-se-pol. That’s right, you can’t enjoy the splendour of all the constructions without a little walk around the city. It is also possible to rent bicycles (there are small public booths around the city) although attention, women have reported problems when trying to rent one, supposedly it is not allowed to ride a bike being a woman so unfortunately, it is not a viable option for all, however If you want to do it we recommend you try. Throughout the river, you will find the rest of the 11 bridges mentioned, although depending on the stretch you will see some or others. It is common to get to the botanical garden walking and return in public transport, even better is to do it on a Friday, picnic day for all Iranians, and catch up with the outdoor atmosphere of the city. We stayed here, the owners were super nice, we did not see any other tourist in the building. Most of the low budget accommodation is in Charbagh st. between Masjed Seyed St and Bab Al-Rahmeh St. Best thing to do is to go down in Takhti station and walk to the river while looking for a place to stay.